Let's take a look at our collection. Requires the use of ultra low sulfur diesel fuel. Mercedes-Benz Sprinters are approved to use B5 biodiesel (approved diesel fuel with a maximum 5% biodiesel content) in all BlueTEC engines. The only approved biodiesel content is one that both meets ASTM D6751 specifications and has the oxidation stability necessary to prevent deposit-/corrosion-related damages to the system (min. 6h, proven by EN14112 method). Please see your service station for further information. If he B5 biodiesel blend does not clearly indicate that it meets the above standards, please do not use it. The Mercedes-Benz Sprinter New Vehicle Limited Warranty does not cover damage caused by non-Mercedes-Benz approved fuel standards. * Pricing shown includes all applicable dealer fees including Freight/PDI, Admin, EHF Tires, Filters and Batteries, and applicable provincial fees. Prices do not include taxes, insurance and license fees, as well as any other products or services not listed that may be available to you through your selected Mercedes-Benz dealership. Vehicle prices subject to change without notice. Dealer may sell for less. Please contact the dealership directly for exact pricing details and total prices. Note: Vehicle may not be exactly as shown. Some vehicles may be shown with optional equipment or equipment not available in Canada based on the Government of Canada-approved testing method and as published in Natural Resources Canada’s Fuel Consumption Guide. Your actual fuel consumption may vary. **Regarding towing capacity listed: Maximum permissible gross weight of the trailer, if the trailer is equipped with a separate functional braking system. Please make sure to comply with local trailer load regulations. Suggested retail price of the manufacturer. Shipping and preparation included, taxes extra. Does not include current promotions. Apply online to know applicable specials. The purchase price displayed may vary depending on whether the vehicle is leased, financed, or paid in cash. Please note the Drive Green government rebates are included if applicable..
† Some vehicles are shown with optional equipment available at extra cost. Some optional equipment may not be available individually and/or on all models. For current information regarding the range of models, standard features, optional equipment, and/or colours available in Canada and their pricing, please contact us . 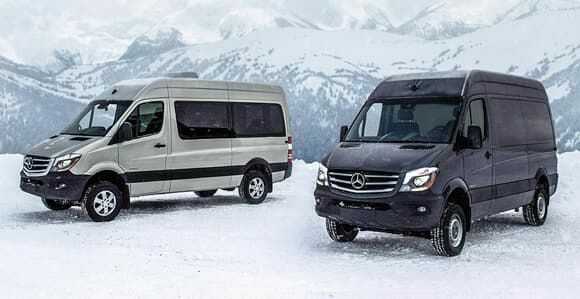 Discover exceptional offers available on our Mercedes-Benz Vans models. Mercedes-Benz Vans available in Greenfield Park. 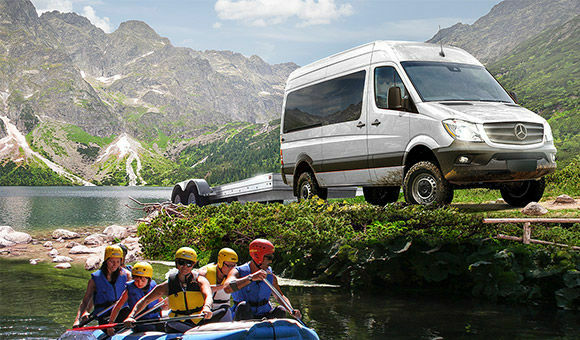 Explore the complete inventory of expertly designed Mercedes-Benz Vans. We make the hardest-working vans on the road, but that’s not the only thing that sets us apart. We put the same quality into every aspect of the Mercedes-Benz experience. Maintenance, warranties, finance solutions, fleet services. They're all a part of the Mercedes-Benz ownership. The lowest total cost of ownership (TCO) of all full-size and mid-size work vans. There are many reasons why our vans are the ideal solution for businesses requiring a reliable fleet. The bottom line? Our vans protect your bottom line. No other manufacturer offers more versatility or more ownership savings. In fact, the Sprinter and the Metris were awarded Vincentric’s Best Fleet Value award in Canada™. From the customizable Sprinter to the mid-size Metris, we have the solutions that mean business. Best fleet value in Canada. For seven years consecutively, the Mercedes-Benz Sprinter has received the coveted Vincentric Best Fleet Value in Canada™ award. We are proud to announce that for its third year, the Metris has also been honoured for its best-in-class fuel efficiency, extended routine maintenance intervals, and outstanding retained value. Mercedes-Benz Sprinter and Metris vans are by far the best, and hardest-working, fleet vans you can ask for. A Mercedes-Benz is built to meet the highest standards. It’s what you’ve come to expect from us. And now, it’s what you can expect from our growing network of MasterUpfitters. Nothing gives you more flexibility and options than one of our upfit-friendly vans. Whether it’s the versatile space of the Metris, the expansive size and near-vertical walls of the Sprinter, or the unobstructed frame rails of the Sprinter Cab Chassis, our vans can handle any configuration you require. And when combined with the expert craftsmanship of a Mercedes-Benz MasterUpfitter, there simply isn’t a more flexible work van on the road. The 2018 Mercedes-Benz Sprinter: the gold standard of the transportation industry.